Stocks took a bit of a breather last week, so no change in the outlook to start this week. 2 out of 3 signals continue show an uptrend. 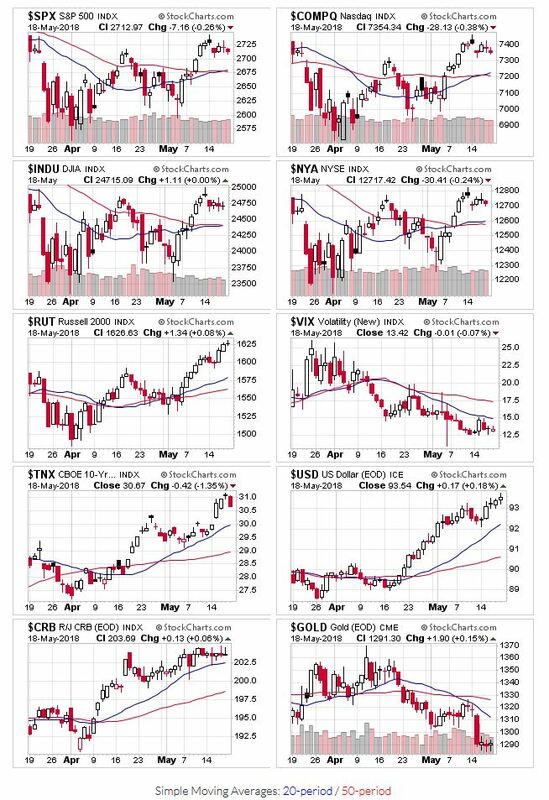 All the major indexes remained above their 20 and 50-day moving averages, leaving the moving average signal in an uptrend. 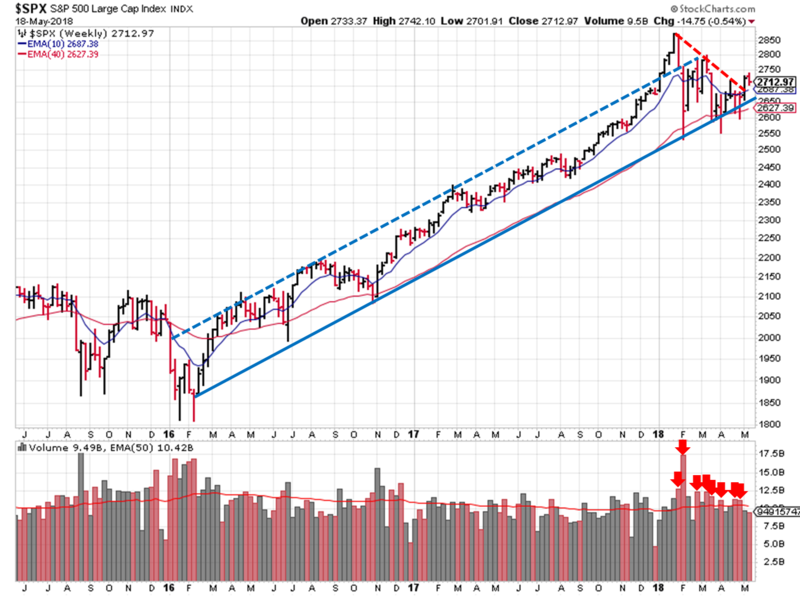 Trading volume continues to be the biggest weakness for the market since January. 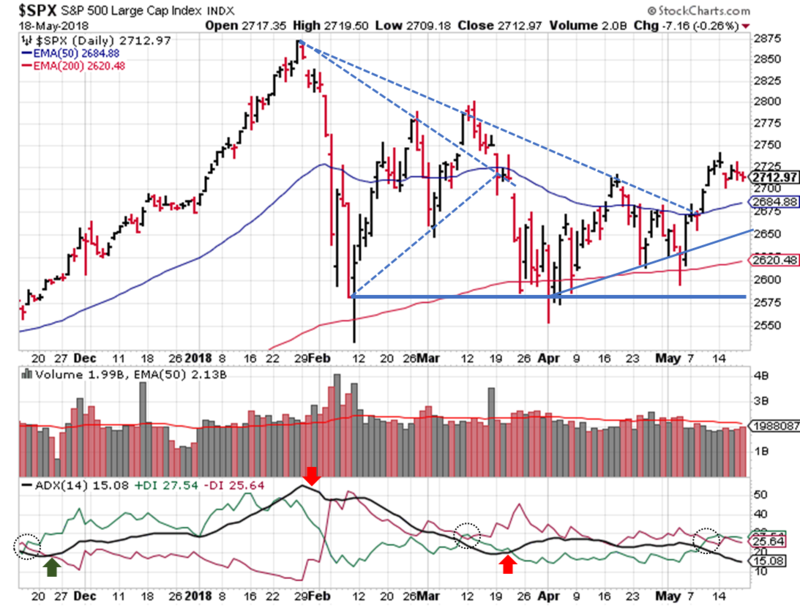 The S&P picked up 3 distribution days last week, elevating the count to 7; the last 10 trading sessions the S&P closed lower resulted in distribution days. On the positive side, 3 distribution days will come off the count next week. And I witnessed more break-outs last week, and a few even had decent trading volume! OEW uptrend remains in place. I'm still waiting to see if we can move past last Monday's high, or if that becomes a point of resistance for a new descending triangle. As far as the ADX is concerned, the DI+ remains higher than the DI- (barely), so it does signal an uptrend. But a falling ADX, combined with a low value (<20) suggests a really weak trend. Until the ADXv value can climb back above 20, sideways price action is likely. At least the latest rally hasn't sold off with the same volatility we saw during the last few attempts (February, March, and April). The lower bound of the long term price channel currently sits around 2660, which is above the 200-day moving average, but not the 50-day. And in a first for 2018, we had a down week without higher trading volume; another positive sign for this fledgling uptrend.